When we got Radar, he was 5 months old and did not know even basic commands. I struggled to find basic commands for a blind puppy. I could only find commands for dogs that had gone blind, none for dogs that were blind from birth. So I had to figure out what commands to use and how to train him on my own. The one bit of advice I did glean from the research was the “careful” command. So I started there and decided to train him like I have every other dog. It is a good reinforcement of the voice command and helps the puppy/dog focus if I am giving them both vocal and visual. It comes in very handy when I am in a public or loud place to not have to compete with the noise level. 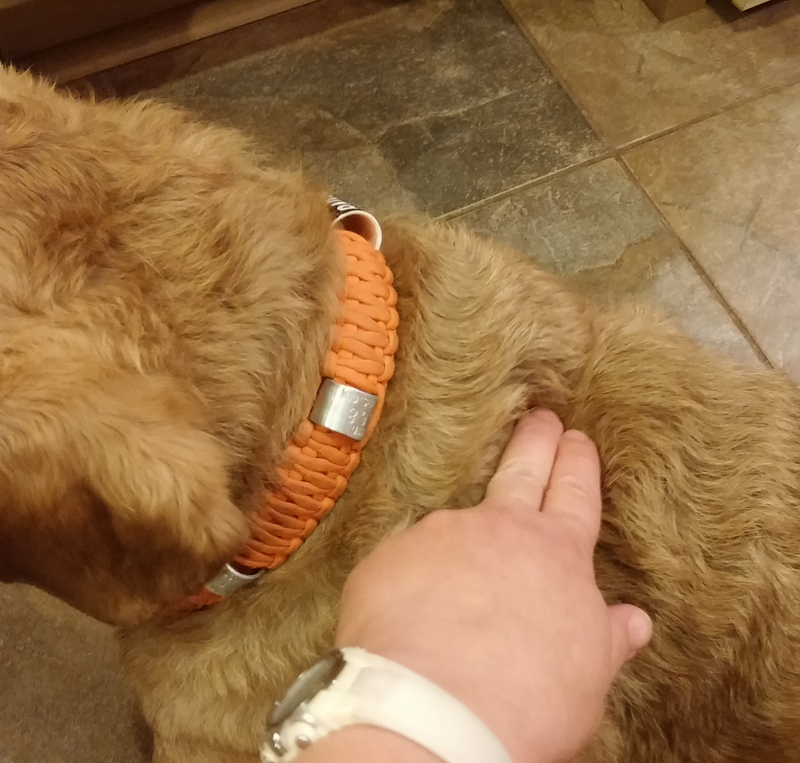 It is also handy if I am in a quiet area and I do not want to call attention to my dog by vocalizing commands. Finally, as the dog ages, they may begin to lose hearing so I have a backup method to communicate commands. Obviously hand signals were not going to be an option for Radar but I wanted a backup command method so I decided to devise touch signals. Unfortunately for Radar, he had to learn along with me on what touch commands would be effective. The following is a list of commands and the corresponding touch command that I am using. They are somewhat in order of priority. 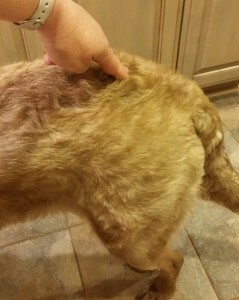 Touch Command for Sit – two fingers lightly touching the high point on top of dog’s hips. Touch: Fingers tips touch on highest point of his rump. The key here is “touch” not push or force, just a quick, light tap with 2-3 fingers. I actually use the “sit” command as a “Please……”. I teach all of my dogs that they must sit or “say please” before I will do anything for them. Before they get their meal, a treat, the door opened to go outside or inside, before petting, before I open the crate door, etc. Granted I am not as much of stickler as I would like to be but do try. This is my goal and I find the more obnoxious, anxious or hyper the dog, the more I use the sit command for please. Touch: No touch command on this one as I am rarely near him when I use it. This is almost or sometimes more important than “sit”. This is a command that your blind puppy/dog will become extremely dependent on you to give. This is to alert the dog as they are approaching an obstacle or hazard. I find that the word along with the tone in which I deliver it lets Radar know how critical or dangerous the situation is. If he is walking towards a tree or post, I will just say “careful” in a normal relaxed tone. If he is running towards the tree or post and he needs to react quickly and abruptly, I will say it louder and with more inflection in my voice. You must be careful to not overuse the panicked, loud tone or the dog will begin to ignore it. Your dog will bump into and bounce off of things so you have to get used to it. That is really how they learn where things are. The key is to make the bounce/bump gentle so they do not get hurt but they learn how to navigate. Touch: No touch command on this one either. These two commands have made me think about getting a vibrating collar so I have a backup method. I teach this command by walking with the dog to a distraction such as a person or a treat on the ground. When they are distracted, I turn away from the dog to the end of the lead and say “come”. I then run backward so they are chasing me and I continue to say “come” in a very fun, energetic manner. I try to make this a fun and energetic command so that the dog associates “come” with good and positive things and I reward heavily – treats praise and every now and then I give an “Out of this World”/High Value treat like liver. 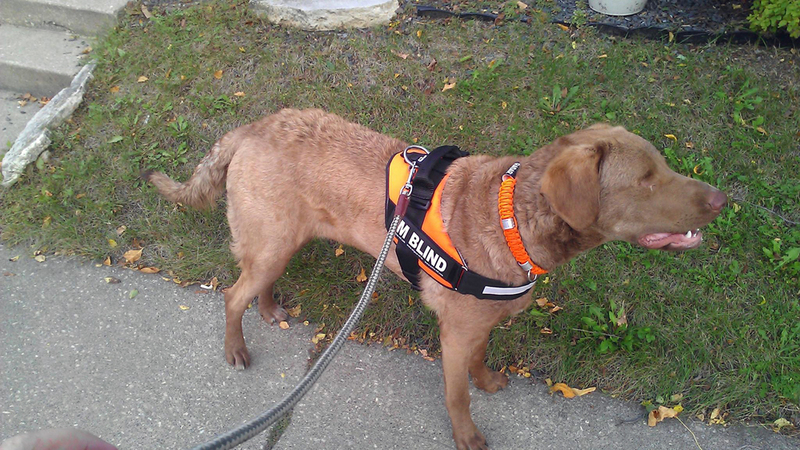 This is a command that can be lifesaving for any dog but even more so for a blind dog. This is a command that must be mastered before a blind dog can be off leash. One word of advice or caution on this command is not to teach it in combination with the “Stay” command. I completely separate the “come” and “stay” commands as they are opposites, used at different times and really very rarely used together for my dogs. “Stay” means I do not want you to move until it is safe and when it is safe, I do not want you to bolt or run somewhere, I want you to get up and stay with me. “Come” means stop what you are doing and immediately come to me for an awesome reward. And those rewards for coming have to be AWESOME and CONSISTENT in the beginning. If I do not have treats then I rub him, love him up or do some goofy play that is only done when he has “come” on command. Just because…: I also consider any attention I give the dog to be somewhat of a reward so I am careful to not use my “Out of this World Good” rewards when we are just hanging out with each other. This does not mean I do not interact, pet, rub or talk to my dogs, I do all of the time but I do not use my “Out of this World” Good tone, treats or toys. Discipline – I am very careful when and how I use negative interactions. I know many people do not believe in using negative reinforcement but I feel there are certain behaviors that I have to correct with a negative consequence. One of these is lunging or excessively barking at people or other dogs. These are behaviors that are never acceptable in my book and need to be corrected. Touch Command for Stay – flat hand in front of nose. Touch: Flat of fingers or palm of hand to the front of the nose. Same premise as using the “HALT” hand signal for stay but put your hand flat to the front of the dog’s nose. I follow the same process in training the stay as I do with a blind dog. I start with a sit stay and work towards a longer time and farther away. I do start by holding my hand on their nose lightly to stay and then as they start to get it I slowly moved my hand farther from his nose. I do keep reminding with the verbal command as this not only reminds and reinforces the command, it also reassures the dog as to where you are and that you have not left them. I do not ask them to “come” from the “stay” command. I always walk back to them and reward them for the “stay”. 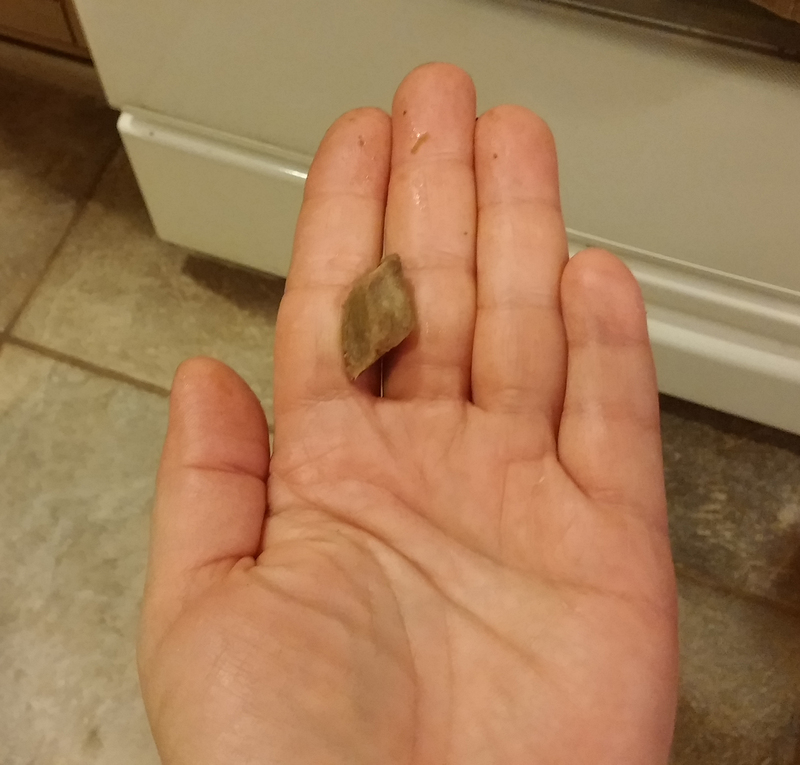 How I hold treat in my hand for teaching Down. Touch: Two fingers touching lightly between the dog’s shoulder blades. I ask the dog to sit. 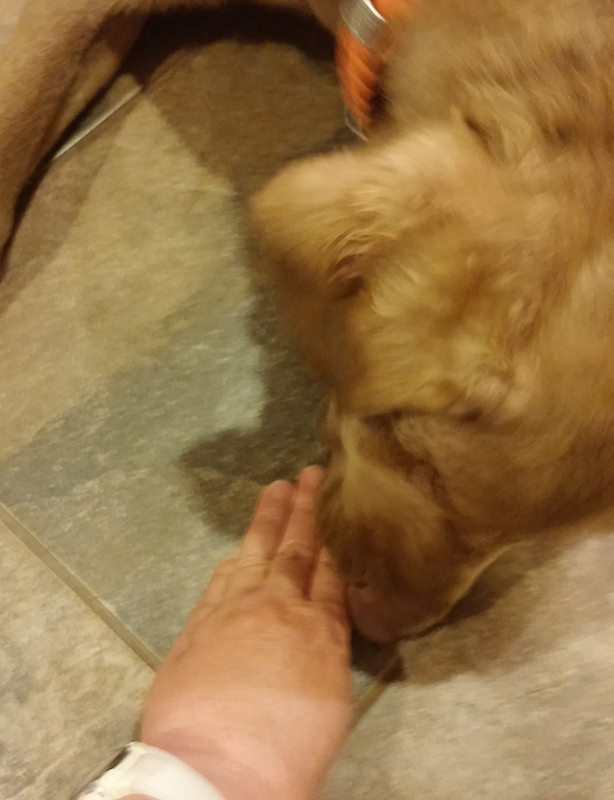 Then with a treat on the underside of my hand between my index and middle finger, I make sure the dog smells the treat and then I slowly lower my hand to the ground at an angle that slopes away from the dog so they naturally move towards a down. Once they are moving toward the down position, I will lightly touch between their shoulder blades with my free hand while I am saying “Down”. As soon as they are lying down, I open my fingers and allow them to get the treat. I will often as them to “stay” in the down using my free hand in front of their nose. 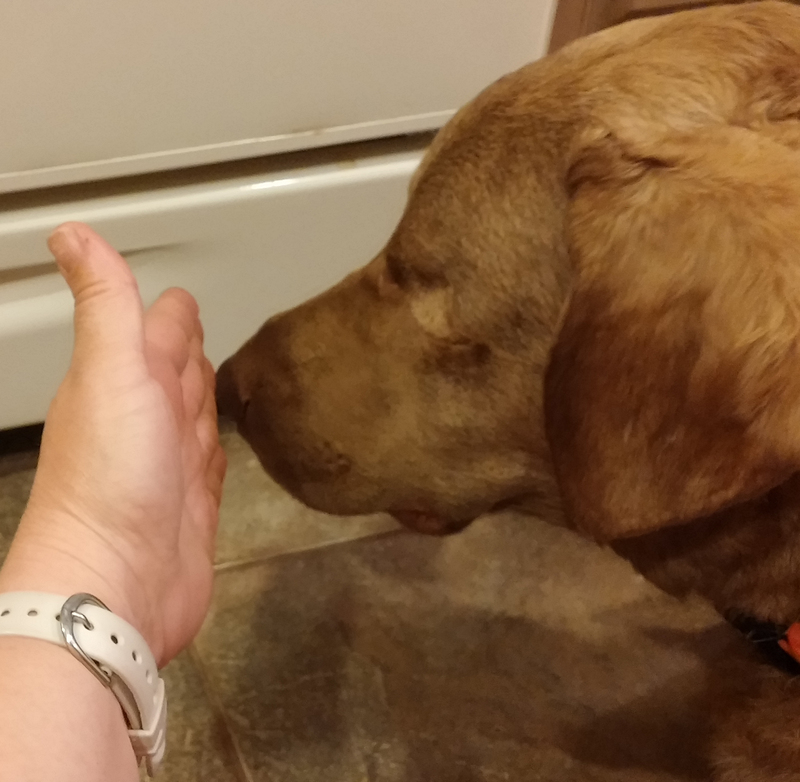 Hand holding treat moves down and away from dog so he can follow it until he is lying down. Touch Command for Down is two fingers lighting touching between dog’s shoulder blades. I will often combine “sit”, “stay” and “down” so they work on a “sit-stay” and a “down-stay”. Once the dog has mastered the “sit” I will ask them to “down” before they get their meal. I will also use a “sit-stay” and “down-stay” at meal time. This is a great way for them to earn their meals and solidify your commands. Touch: I don’t really use a touch signal here as much as I have the dog on a leash and use the leash to aid in the movement. Start with a Curb – I start with a curb on a very quiet street. The distance is short distance for the pup to stumble down and up so they can easily regain their footing. The quiet street also allows us to work back and forth in the street and sidewalk going up and down. As I approach the curb, I give a little check on the leash and then as his last foot falls on the level, I say “Step Down” and provide a little tension on the leash so I can keep him from going head over tea kettle. I then walk a few steps (count the steps so you can repeat this same recovery distance) so he can regain his confidence and momentum. I then turn around and walk back to the curb. As we approach, I give a short check on the leash to get his attention and the as his last foot hits the ground before the curb, I say “Step Up” and a lift up on the least to again try to provide support and a clue about what he needs to do. I then walk the same number of steps as I did on the recovery in the street, turn and repeat. I will repeat the Step Up and Step Down until I feel he is getting it. Make sure the dog is actually understanding the commands before you forget as they learn from repetition. I will often do 10-12 repetitions and then we will walk up and down the sidewalk avoiding and elevation changes or play a few games, belly rubs or something for a break. Once the puppy has had a break, do another 10-12 repetitions. I would do 2-3 sets per day and continue doing this until the pup understands the commands. Then you can venture off on a walk in the neighborhood. Radar’s harness with handle. This is a Julius K9 harness with removable I’m Blind labels. 3-4 Steps – Once I have taught a basic sidewalk “Step Up” and “Step Down”, you can try a few stair steps (2-3 steps maximum). When I teach steps, I repeat “step up” for each step and use the supportive leash action. Teaching “step down” on multiple steps can be more difficult as the dog is normally unaware they are stepping down into thin air on a single or first step, however stepping off into thin air a second or third time is not so easy.This is a where High Value treats or a vest with handle might come in handy. I have also found that if I can pat the step so Radar can hear where the ground is and if he can feel that I am holding his vest handle he will take that step off into thin air more willingly. 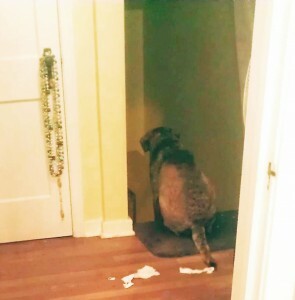 Radar sitting on his bathmat at the top of the stairway. Flight of Stairs – Teaching a flight of steps is a whole different lesson. Going up a flight of stairs is usually not much of a problem. Again I will use the “step up”command on each step and use the leash to give a little lift. I have wood steps and hardwood floors so I have put fuzzy bathmats at the top and bottom of my staircase so Radar knows when he has reached the top and bottom of the flight. This also serves as a safety indicator at the top of the staircase so he is less likely to fall down the stairs. I also used a baby gate for a few months until I was confident that Radar knew what the bathmat meant and he was confident descending the stairs. Teaching a dog to go down a flight of stairs is more challenging. I did not have a harness at the time I taught Radar and I now think that would make it much easier and less traumatic for the dog. I would still go about it in the same fashion. With Radar I had really yummy and SMELLY treats! SMELLY is key as they have to be able to smell the treats from a few steps above. If possible try to find a shorter flight of stairs first, however most of us do not have access to shorter flights so you must be very patient and able to spend lots of time. I start with a treat on each step. I walked Radar to the top step and said “Step Down” which he did since he knew that. However he was not going to do it again. I stay in front of him but try not to get your voice to far beneath him as that will make the drop off seem that much farther down and scarier. Try to keep your head and therefore your voice above his head while tapping the stair with your foot. This is where I feel the vest with a handle would have given Radar more confidence as he will jump out of my car if he can feel me holding his vest handle. Once I got Radar to take three or four steps the rest were nothing but those first few steps took a long time and a lot of coaxing. In hindsight, I now can see where I did not help the situation. First, I got too far below Radar and I am sure the sound of my voice 3 or 4 steps below him in the echo of the stairwell sounded extremely scary. I should allowed or encouraged him to use the solid sidewall as I guide instead of putting his treats down the center of the stairs. I also should have had one of my other dogs go down the stairs a few times so he could hear them as he is more willing to follow them into the unknown than he is me. Why he is so trusting of them over me is a mystery to me but he is! 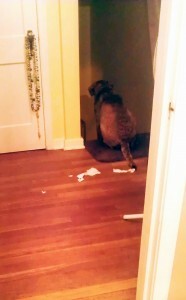 Here is a video of Radar descending the stairs for the third time or maybe fourth. Touch: I don’t really use body touches for these but I do pat the surface that he is to land on and I hold onto his handle to provide support, confidence and to help gauge his jumps. I use “up, up” mostly to get Radar into the car. I pat my hand on the surface that I want his front feet to hit when he jumps. He does not jump up with his back legs. I either lift his back end in or if there is a running board or box, he will climb with his back legs. I use “down, down” to get Radar to jump off of things such as jump out of the car. This is one command he will not do without his vest on and without me holding onto his harness handle. I tap my foot on the ground while holding his handle and just holding enough weight with the handle so Radar can feel it and I can guide him safely to the ground. These are the basic commands that I use with Radar daily. There are many other commands and life skills that I have taught and will be teaching Radar but he needed to master these basic skills first.